Sustainability is a university value that continues to grow in importance, thanks in part, to student leaders who care. Sustainable food systems and targets for reducing greenhouse gases, waste and water use are all areas in which our university wants to lead. Here’s where you come in! UBC aspires to be a campus where all unwanted products and materials will be treated as resources to be used again. 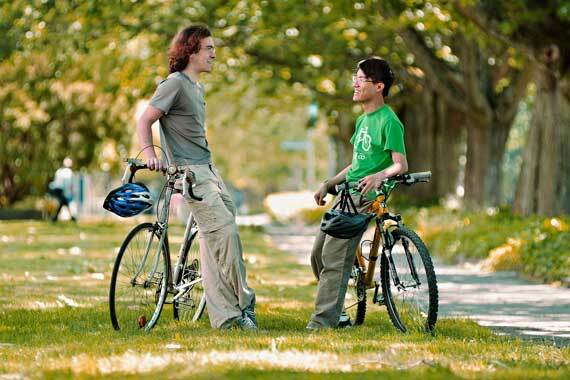 UBC residents play a huge role in helping us achieve our goals. Residences are equipped with sorting areas for recyclables, e-waste, and trash. Take shorter showers (save up to 20 litres per minute). Aim to buy or cook organic and local produce. Moving sustainably means donating, trading and recycling materials you don’t plan to take home with you. When moving out of residence, follow the five steps of a mindful move out. UBC also offers more than 480 courses that explore and engage the economic, social and environmental challenges surrounding sustainability. Taking some of these courses may make you think and act differently by broadening your learning experience.